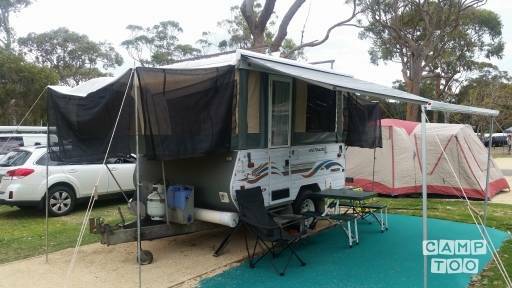 Off-Road Van setup for either free camping or caravan parks. Once the roof is wound up the beds pop out the ends to 2 x double beds to sleep 4 comfortably, water storage 100ltrs, microwave, toaster, 4 gas burner stove & grill, 90 Ltr 3 way fridge/freezer, Dimmable LED Lighting inside and out, easy to use Folding arm main awning, Portable solar panel with house battery. Great little water tight van, easy to tow and setup (20 mins). Van well serviced and looked after regularly, however, cosmetically this van is 15 years old so has some skuffs, marks and chips of a used van of that age. 2. Your tow vehicle must have full Comrehensive insurance. 3. Your car needs to have a towing capacity of =>1220 Kgs. & have a 7 or 12 pin flat trailer plug. · 400ltr Roof Pod for Car. Extra $30 ea per hire period. •USB 12v charging sockets, for phones, etc. Full bond refunded when caravan is returned in its’ pre-pickup condition. Full cleaning policy inside and outside before returning. Bring it back in Pre-Pickup condition. Need to tell owner where you are taking van. If you are going on any Dirt roads, you need to inform owner and get permission.